Wonderfully soft and super light lash extensions. Ideal for adding a touch of colour and creating super fluffy Russian Volume 2D-6D sets! Be as subtle or as bold as you like with these summer meadow inspired lashes! This two shade multi-length pack will help you create natural, abundant looking eyelashes with a hint of beautiful colour! Coloured lashes are also used for creative/photo fantasy looks. This is a great product if you would like to experiment with different colours as it contains our most popular lengths. It is also ideal for mobile therapists and lashpreneurs just starting out or just want to try our new London Lash eyelashes. Buy a couple of these in various shades and you're covered for a wide range of looks without the need to invest much or carry around lots of different packs. Available in B/C/CC/D curls to suit a range of clients! 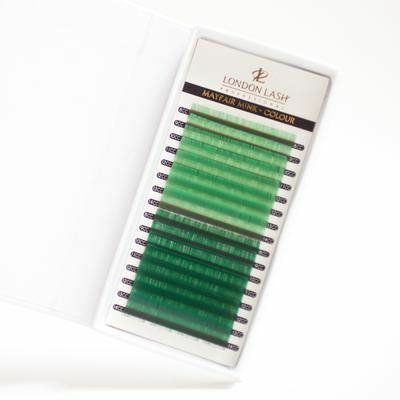 Need advice about 0,07 Mixed Size Light Green/Green lashes Mayfair Mink B/C/CC/D?